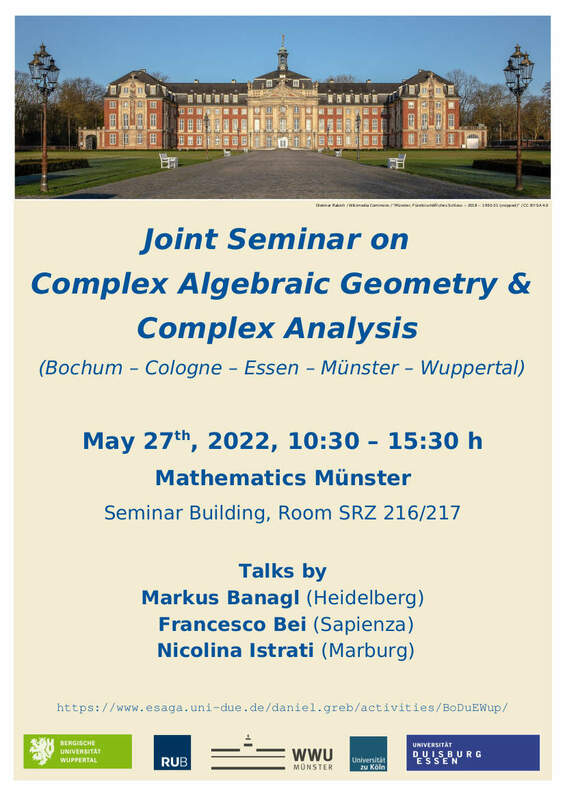 The "Joint Seminar on Complex Algebraic Geometry and Complex Analysis" is a research seminar, organised by the algebraic and complex geometry research groups in Bochum, Essen, Cologne, and Wuppertal. The seminar meets roughly twice per semester for a full day in Bochum, Essen, Cologne, or Wuppertal. There are three talks per meeting, both by invited guests and by speakers from the organising universities. We aim to leave ample room for discussions. The talks are open for everyone. Contact one of the organisers if you are interested in attending the meeting. We have some funds that might help to support travel for some junior participants. SFB/TR 45 "Periods, moduli spaces and arithmetic of algebraic varieties"
SFB/TR 191 "Symplectic structures in geometry, algebra and dynamics"
The next meeting will take place on Friday, July 5th, 2019 in Cologne. All talks will take place in Room 204 (Seminar room 2). How to find the lecture hall: see the following map.